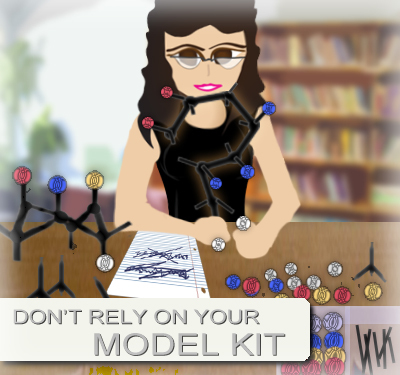 If your professor says you can use your organic chemistry model kit on exams, I say DON’T. Don’t rely on it that is. Organic chemistry is a 3-dimensional subject that you learn on 2-dimensional paper. I know this sounds confusing but as an orgo student you’ll learn many tricks to work through 3-D problems on 2-D paper. To completely learn and understand these structures, you must transfer them from the flat lines on paper to your brain and visualize them as realistic, space-filling models. This process is difficult for many students so I highly recommend that you acquire a model kit. I use/recommend the Molecular Visions Model Kit (click to purchase on amazon.com). By watching the molecule change, or the atoms/bonds rotating, the material comes to life! You now have a visual reference to refer to when you study and answer questions. So if I’m pushing so hard for a model kit, why did I advise against it? There’s a difference between using the kit as a study aid and using it as a crutch. Many of my students are allowed to bring a model kit to their exams. I couldn’t believe this when I first heard it! My advice to them: Bring the kit but try not to use it! When you know you’ll have to answer questions and derive solutions based on your understanding of, and ability to explain certain concepts, you will study that information intently. However, if you know you have something else to rely on besides your brain (like a kit), you are less likely to learn that information as earnestly. Why? because you know you have a crutch to help you if you need it. I personally make it a point to know important phone numbers just in case I break/lose my phone (which I’ve done more than once) and I can’t rely on it as a crutch when I’m in a crunch! The point is that when studying topics like Newman Projections or chiral centers, if you know you’re not allowed to use a model on your exam, you will study intensely to ensure that you can deduce the required information. You probably won’t know the information as well as you should. You probably won’t learn enough of the topic. You probably won’t remember the information long term. The time it takes to build and work out the structure may take much longer than the time it takes to quickly apply a concept and answer the question. Having said all of this, you should still bring the kit to the exam! Think of it as a security blanKIT. You don’t have to use it but you have it just in case you get cold feet! What If You Freeze?—Let’s say you see the first Newman projection question and blank out. It happens. In your sheer panic you must find a way to re-engage your mind. Take out your “security blanKit” and build the model. Those few seconds may be enough to thaw your brain and snap you back to reality! What If You Get Stuck—or Simply Forget? Let’s face it; no matter how well you prepare for an exam, you will likely feel that you are not ready. It’s the nature of the beast. So worst case scenario, if good ‘ol logic fails you, the model will “cover” you. If you feel that you must rely on a model kit, you can fall back on it! Bring a kit that you are familiar with—the same style that you used to study. This will ensure that you know how to manipulate the structures. Pre-build your kit for the type of questions to come. Build a general structure that you can shift around as you need. The less you have you build during the exam, the more time you have to analyze your structure and answer exam questions. If your exam is on Newman projections: pre-build a Newman projection. I recommend building a 2-carbon chain with unique color substituents on each end. Pre-build a few more carbon components in case you need an isopropyl or tertbutyl group on the chain. If your exam is on chair conformations: build 1-2 cyclohexane rings with 2-3 different color substituents attached randomly at the axial and equatorial positions. If your exam is on the beginner topics of stereochemistry where you have to find R/S, build a single carbon unit with 4 color substituents, then build a second one that is the mirror image or non-superimposable enantiomer of your structure. If your exam is on advanced stereochemistry involving multiple stereocenters, diastereomers and meso compounds, build 2 molecules, each 2 carbons long, with uniquely colored substituents. I definitely agree! The only time the model kit was helpful was when you are trying to determine chirality and the lowest substituent group is on plane. Thanks for the feedback and I guess it’s a good thing the kit arrived late?